My 14 month old son loves to follow me around our home. I am sure that one of his favorite rooms to be with me is the kitchen. The kitchen has drawers and cupboards filled with various and interesting items sure to attract any toddler. Of course having a toddler hang with you in the kitchen is not all fun and games. Safety should of course be first priority. 1. 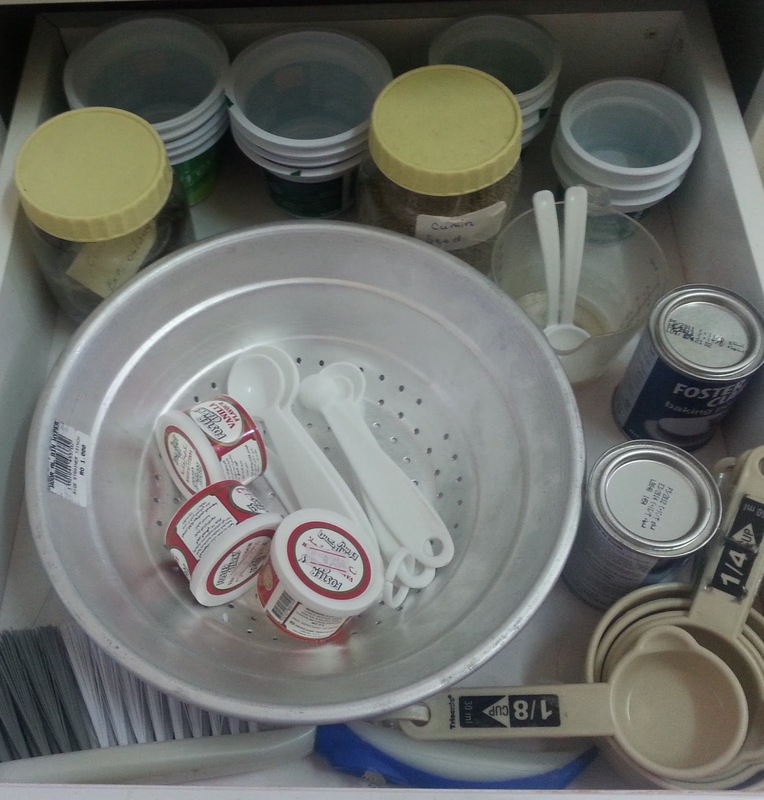 Use drawers and bottom cupboards to place items such as pots, pans, plastics, well sealed dry and canned foods. Keep anything that may potentially cause him harm such as knives and glassware above. 2. When cooking using the stove top select the burners farthest away from reach. My son cannot reach any yet however I am not taking any chances. 3. Store toxic chemicals such as household cleaners in another room locked in a cabinet. If you have to have them stored in a kitchen cupboards keep them under lock. 4. Before turning on the oven it is best to remove toddler from the room. 5. Make a personalized kitchen drawer. Fill it with items that can be played with safely. Measuring cups, spoons, plastics, and yogurt containers are great for this. Add something different every once and awhile to keep interest. Here is a picture of my son's own kitchen drawer! Have you tried this idea? If so what items did you use? These are awesome tips. My 16 month old is now tall enough to reach the stove and the counters so we have to be extremely cautious. I definitely use the cook on the farthest burner as often as possible and I used to have a cabinet he could plan in and then me and my husband realized this was a huge hazard because I could trip over one of the items he had on the floor. :( Thanks for sharing these! Thank you for stopping by. Our son is always puting things on all floors of our home so we have gotten used to it. He is such a busy baby. Safety is important for the little ones. My son loves to be in the kitchen with me too. I had a drawer for my two boys also :) They loved playing in the kitchen when I cooked! Great tips! It seems as though the kitchen is a favorite for little ones. Even when it is hot in the kitchen my little guy will stay with me. Thank you so much for stopping by and showing such appreciation!